February 14, 2018, ©. Leeham Co: Norwegian Air Shuttle (Norwegian) is in an aggressive expansion phase. The airline is setting up as many low-cost routes as possible across the Atlantic, to gain critical market share before the competition gets organized. Such expansion costs money, a rare commodity at Norwegian. The company presents its 2017 results Thursday. We analyze what to expect. Norwegian started its low-cost long-haul 2013 with wet-leased Airbus A340s (as the ordered Boeing 787-8 were delayed). The long-range expansion went into overdrive 2017, with 19 new trans-Atlantic routes opened over four months. 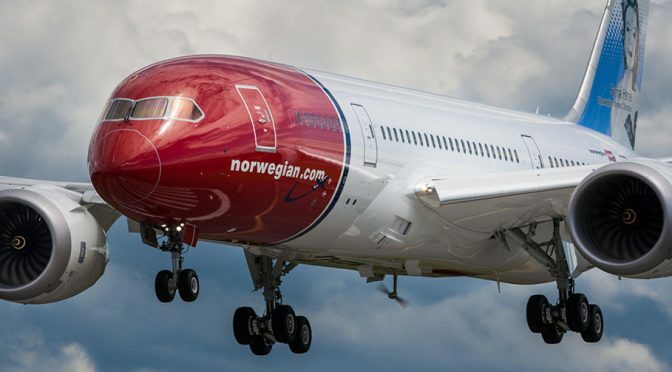 In a presentation at the January Airfinance Journal conference in Dublin, the airlines acting CFO, Tore Ostby, said Norwegian needed to grow fast to a fleet of 50 long-haul aircraft to enjoy scale advantages. Right now (Figure 1), the long-haul fleet is 21 787 with another 11 arriving 2019 and six Boeing 737-8 with another 12 arriving 2018. Figure 1. Norwegian fleet expansion 2017 to 2019. Source: Norwegian. In addition, Norwegian is opening a new LCC operation in Argentina with its short-haul fleet. To operate these aircraft efficiently, Norwegian hired 3,000 pilots and cabin attendants last year. The new personnel need to be trained and certified for the aircraft before contributing to the operations. This is a major investment for Norwegian, besides the new aircraft. A fast expansion costs money. This is fine if done by a company with a solid balance sheet and enough cash reserves. Norwegian has neither. The balance sheet had 11% own capital when exiting 3Q2017. Normal is 20% or more for non-expanding companies (easyJet and Ryanair are both above 40%). Norwegian had NOK5,567m or $674m cash or cash equivalents when exiting 3Q2017. By now a major portion of this should be consumed by seasonal operational losses. Losses are a reality during winter month operations for European airlines. The airline states the monthly production of Available Seat Kilometers, ASKs. In order words, how many aircraft are flying and how far. For 4Q2017 this was 19,704 seat kilometers. Norwegian also states the revenue for the months per ASK, called unit revenue or RASK. Multiplying the ASK and the RASK for each month gives the revenue. For 4Q2017 it was NOK6,065m or $734m. The operational cost is the ASK times the average cost per ASK. For the last quarters, the cost per ASK, including fuel costs, was around NOK0.43 or 5.2 dollar Cents. This gives a 4Q2017 cost of NOK8,473 or $1,025m. The operational loss for the fourth quarter is then NOK2,408 or $291m which is 40% of revenue or 43% of the cash position when exiting 3Q2017. Without financial transactions to improve the companies’ liquidity, Norwegian would have $380m cash left when exiting 2017. This is a close margin for a company in fast expansion in volatile markets, with a cost mass of $300m per month, another tough winter quarter to pass and 23 new aircraft to finance for 2018. As outlined, Norwegian needs more cash for its expansion. The company has sold two assets during 2017 to generate additional liquidity. It has sold shares in the loyalty cardholder bank it started (Norwegian Bank) and has sold owned aircraft to rent them back (Sell and Leaseback). Norwegian raised NOK361m in June and NOK185m in December by selling 6.7m Norwegian Bank shares during 2017. In addition, the company has sold 28 737-800 and rented them back from the new owners. Dependent on how much of the aircraft value was financed with aircraft secured loans, these sales inject cash to the company in exchange for future higher aircraft lease costs. Norwegian will present the 4Q2017 and 2017 annual results Thursday. The company is running a risky expansion strategy at present. It will be interesting to see how the company has fared with liquidity and balance sheet margins. This interest is shared by the stock market. The Norwegian share tanked 40% during 2017. 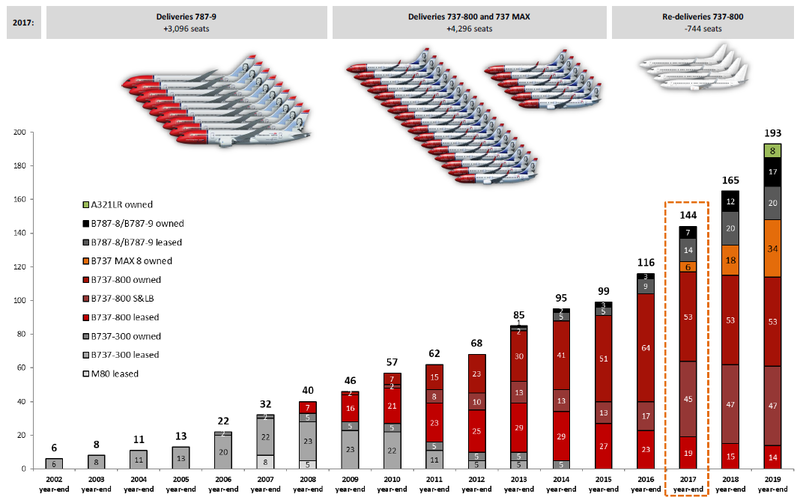 In case anyone wonders what were those 5-8 MD-80s doing in Norwegian’s fleet in 2007-2008 here is the answer. Finnair owned a Swedish LCC Nordic Airlink (dba FlyNordic) based in Stockholm and sold it to Norwegian in 2007. FlyNordic operated Swedish domestic, intra-Scandinavian and European routes. Their fleet consisted of leased MD-80s (sourced from Finnair and other lessors). (1) what is their minimum efficient scale (MES) given their planned fleet and route structure (bases, focus cities, etc.)? (2) how well are they positioned when oil prices spike? (3) will only B787 and 321LR routes survive with high oil prices? Are there any safety implications about expanding that fast?I think the FAA has ordered airlines to slow down in the past. Why is the RAT deployed in the photo? Q4/2017 comes on Thursday, not Friday. It would also be nice to proofread your texts before publishing them. Norwegian can’t keep growing as it has done over the past years. It’s a real shame if the airline goes under because of the CEO’s megalomania. Norwegians Investor relations page states the 4Q2017 result is presented on 16th of February, which to my calendar is Friday. Perhaps some checking is due by Investor relations. Norwegian should ditch the a321LR. Why complicate the fleet so much for so little? The Norwegian result for Q4 2017 is out. -652NOK. They expand like a very offensive Chinese Company with gouverment and bank support (the HNA Group of the West…). Hopefully will they make money to pay down debt quickly otherwise in bankrupcy SAS will be ready to pick up their owned 737-800’s, 787-9’s and their coming A321LR’s. It is just one accident away. „Sell and Leaseback“ was cause of demise for Air Berlin. Very thin ice up there in the north. It is not the fastest or most accurate GPS on the earth, nevertheless iit will get the job accomplished most of the time.